The article looks at some of the ways that LED spotlights can be used throughout the home and the advantages of LED technology. LED lighting has been around for a while yet it is only recently that it has started to be used with greater frequency in the home. LEDs started off being used in expensive equipment in laboratories before being incorporated in other commercial goods such as televisions and Christmas lights. 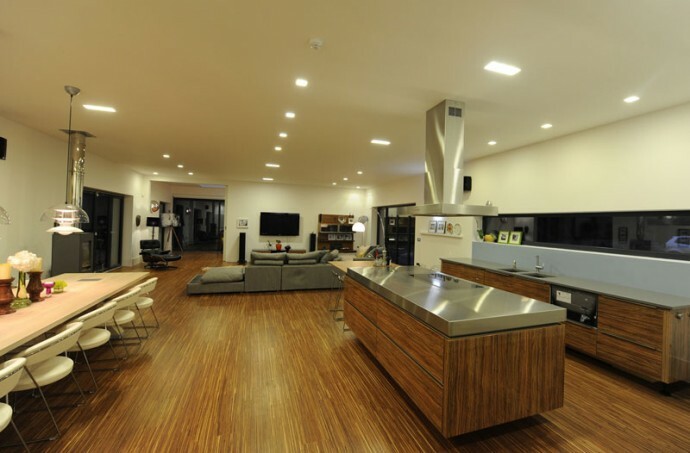 Technological developments have led to an increase in LEDS in the home. One of the main drivers for this is the life span of the bulbs and the cheap running costs when compared to other types of lighting. Whilst LED lights cost more to initially install this cost is recouped over the life cycle of the bulbs. LED bulbs work differently from other types of bulbs. The old fashioned incandescent bulbs have a filament that electricity passes through whilst standard energy saving ones use electricity passing through a mercury vapour and the UV light produced by this is then absorbed by the coating on the bulb to produce light. LEDs on the other hand use a semi-conductor that gives off light energy when electricity passes through. The increasing popularity of LEDs means that they are now some great deals on spotlights to be had. But what is the best way to use them in the home and what rooms are they suitable for? LED spotlights are a great way of creating the right ambience in your kitchen. LEDs enables both task lighting and ambient lighting to be used in conjunction and helps create a space that is both functional and attractive. Spotlights can be used for bright work space such as on food preparation areas and over hobs. Dimmed lighting in other areas of the kitchen, including any dining areas, results in a more cosy and relaxed atmosphere. Bathrooms are another area where LED spotlights come into their own. Rather than a traditional overhead light that gives out a lot of light, although not necessarily where you need it, LED spotlights can create specific zones of light, for example, directly over mirrors, yet at the same time still enable you to enjoy an unwinding soak in the bathtub without the full glare of an overhead. This flexibility that LED spotlights give also makes them particularly useful in meeting lighting requirements in living rooms and bedrooms where they can be used to create both functional and mood lighting. LED spotlights in the living room can be used to direct light to specific areas so that it is possible to read or undertake other activities that require a good level of light or to draw attention to features such as fireplaces or bookcases. At the same time, because the light it being directly only where it is needed, the overall ambience of the room doesn’t suffer and it remains an inviting and comfortable space. The same is true when it comes to bedroom lighting. By using LED spotlights to uplift the light above wardrobes and to give focused bedside lighting it is possible to create an atmosphere that’s about comfort and relaxation rather than just practicalities. LED lights have come a long way and their popularity is set to increase. They have evolved from being purely practical to becoming a great way of creating mood in the home and focusing light where needed and, with energy efficiency at the forefront. James Holden is the digital content manager of Visible Lighting and has many years’ experience in the LED Lighting industry. To find out more information on James Holden, you can follow him on Google Plus.